The winners in each of the three categories will be recognized by HHS and the Office of the Surgeon General during an announcement/award ceremony in January/February 2012. Finalist applications will be featured on an HHS website. The U.S. Surgeon General’s Healthy Apps Challenge will encourage the development and submission of technology applications that will complement and enhance two key aspects of the Surgeon General’s prevention agenda: The Surgeon General’s Vision for a Healthy and Fit Nation (www.surgeongeneral.gov/library/obesityvision/obesityvision2010.pdf) and the nation’s first National Prevention Strategy (www.healthcare.gov/prevention/nphpphc/strategy/report.pdf). 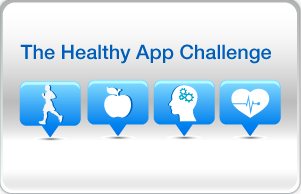 Specifically, the challenge will highlight the ability of innovative new technologies to: (1) provide health information tailored to the needs of the user; and (2) empower users (the general public) to regularly engage in and enjoy health promoting behaviors related to fitness and physical activity, nutrition and healthy eating, and/or physical, mental and emotional well-being. This challenge is being conducted in collaboration with the Office of the National Coordinator for Health IT. Fitness/physical activity: This category is focused on applications particularly aimed at recruiting and retaining those people who are not currently regularly exercising. Nutrition/healthy eating: This category is focused on applications aimed at quickly prepared home meals, eating out sensibly, and getting healthy food when travelling (e.g. in airports) or out and about. Integrative health: This category is focused on applications aimed at integrating multiple aspects of wellness (healthy sleep habits, boosting mental/spiritual health, lifestyle behavior change, social health, family health, community health, etc.). Submissions can be existing applications or applications developed specifically for this challenge. A free version of the application must be available for consumer use. The applications should not require the purchase of additional products to be fully operational. Ability to empower users to engage in health promoting behaviors related to fitness and physical activity; nutrition/healthy eating; or physical and mental well-being. Apps must provide health information tailored to the needs of the user. Each entry will be rated for the degree of new thinking and creativity it brings to applications focusing on the health promotion, disease prevention, and wellness in the three categories outlined. Degree to which scientific evidence or empirical data to help assess and modify health behaviors and wellness outcomes is used. The entry must include a description of how research and science is incorporated into the evidence base underpinning the app. User-friendliness and interactive capabilities. Entries should be applicable and attractive to people who are not early adopters and are not “high tech.” Additional consideration will be given for usability by people with handicaps or disabilities. Potential to help all Americans, esp. those who do not engage in health promoting behavior, to improve their health and fitness. Appeal to those in underserved, hard-to-reach, and Cultural and Linguistically Diverse (CALD) communities will be assessed. Bonus points are available if entry can download personal data and integrate into other health applications, including Personal/Electronic Health Records. Entries must specify information type available (e.g. running log) and measurement unit (calories). The “fun factor” it brings to users who are engaged in health promoting behaviors and on whether it provides “lagniagge” (something extra or a bonus) in health for the user to enhance their personal health, fitness, and/or wellness goals.